Model of Explorer I. 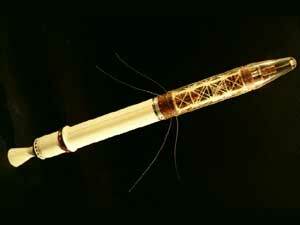 This was the first U.S. made spacecraft to orbit the earth in 1958. Dr. William H. Pickering, Dr. James A. 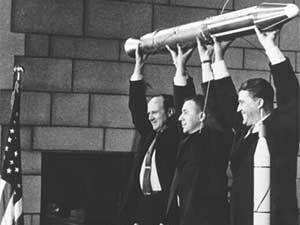 Van Allen and Dr. Wernher von Braun (left to right) hoist a model of Explorer I and the final stage after the launching Jan. 31, 1958. Explorer I, the first U.S. earth satellite was launched by a Jupiter-C with U.S. earth - IGY scientific experiments of Dr. James A. Van Allen, which discovered the radiation belt around the earth.